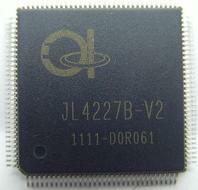 JL4227B is a low cost multi-media SOC. It integrates a JPEC decoder, an image processor, and a rich set of storage devices including MS, MS-PRO, SD/MMC. It also supports xD/SM memory cards or NAND Flash. It provides a dual role port of USB2.0 that can access USB devices, such as pen drive or output pictures/image data to PC. JL4227B allows image display through Analog TFT-LCD panel or TV with GUI interface. It provides rich image process functions to improve display quality. n Embedded a 3-ch video DAC for TV display or analog LCD panel. n Supports ISP Function: Upgrade the system firmware directly from memory cards or USB port.